The follow steps illustrate how to install and activate both ShoWorks and the ShoWorks Training Videos that are located on the CD-ROM. Note: If you do not have the physicall CD-ROM and are a current registered user of ShoWorks, you may download the software here. Start ShoWorks by clicking Start>>Programs>>ShoWorks 2009>>ShoWorks 2009. If you have this icon available under the "Start" menu proceed to step 2, otherwise you have not installed ShoWorks. To install ShoWorks, insert the CD into your CD-drive and click "Install ShoWorks Apeiron 2009" and follow the onscreen instructions. If the menu does not appear within a few seconds, double-click on "Computer" (or "My Computer") and locate your CD-ROM drive and double-click to expand and locate the file "autorun.exe" and double-click. Once you have installed ShoWorks, start ShoWorks under Start>>Programs>>ShoWorks 2009>>ShoWorks 2009. If prompted with the image below (otherwise proceed to the next step), choose "Yes" then in the subsequent box, locate the file: C:\Program Files\ShoWorks 2009\sample.fair (note: the text ".fair" may not be visible). Windows XP Users may need to select "Look in" to find "My Computer" then "Local Disk C:", then "Program Files" then "ShoWorks 2009" to find the sample file. Highlight the file "sample" (or "sample.fair") and click the "Open" button to open the file. 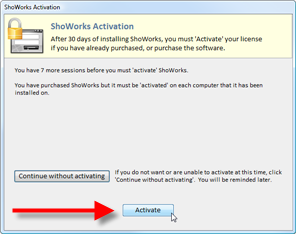 Ensure that you have Activated ShoWorks by selecting at the top, Help>>About ShoWorks, then "Activate". If you have already activated your copy of ShoWorks (each computer that you install ShoWorks on must be activated), then you will see a message "Thank you for using ShoWorks!". Otherwise, choose "Activate" if prompted and follow the onscreen instructions. Once you have sucessfully completed activating ShoWorks, you may install the ShoWorks training videos (optional and purchased seperately). To install the training videos, exit ShoWorks, insert the CD into your CD-drive and click "Install Training Videos" and follow the onscreen instructions.